First of all, black holes are collapsed stars with gravity so strong that even light cannot escape their grasp. One of the black holes we're expecting to get a glimpse of this week – known as Sagittarius A – is the "supermassive" one that's at the center of our Milky Way galaxy. Supermassive black holes are millions to billions times more massive than our sun, and appear to be in the center of almost all galaxies, the National Science Foundation said. Astronomers this week are also expected to release images of another supermassive black hole, one that's 53.5 million light-years away. 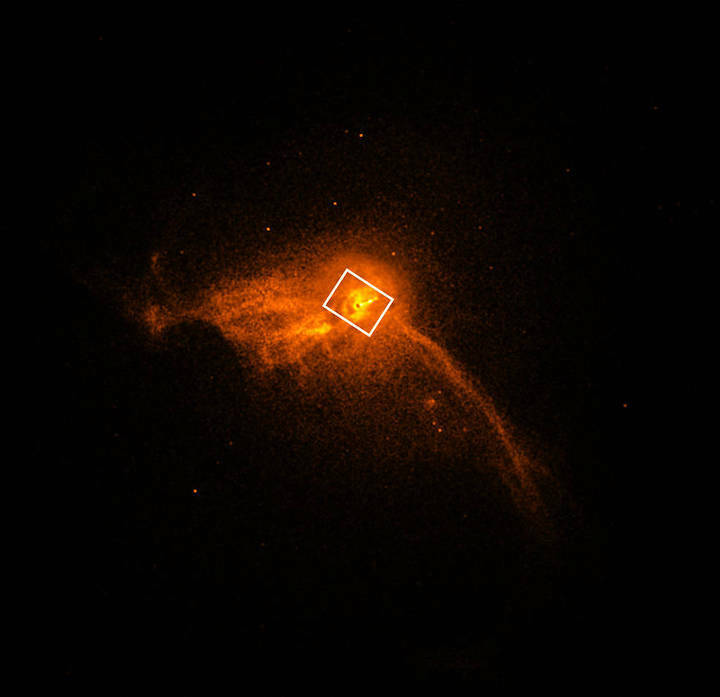 This computer-simulated image shows a supermassive black hole at the core of a galaxy. The black region in the center represents the black hole’s event horizon, where no light can escape the massive object’s gravitational grip. The black hole’s powerful gravity distorts space around it like a funhouse mirror. As its name suggests, a black hole is black, so it'll be impossible to "see" against the black backdrop of space. But nearby objects, such as the event horizon – the edge of the black hole where light can't escape – could be visible. So the photo may show a dark blob surrounded by a ring of bright light, according to Yahoo. But that also might be a challenge, since the black hole at the center of our galaxy is "shrouded in a thick cloud of dust and gas," Science Alert reported. As you might expect, this won't be your run-of-the-mill photo of the night sky from your smartphone. Images will come from the Event Horizon Telescope, a collection of telescopes around the world specifically designed to peer at black holes. The telescopes are in Chile, Hawaii, Arizona, Mexico, Spain and at the South Pole. 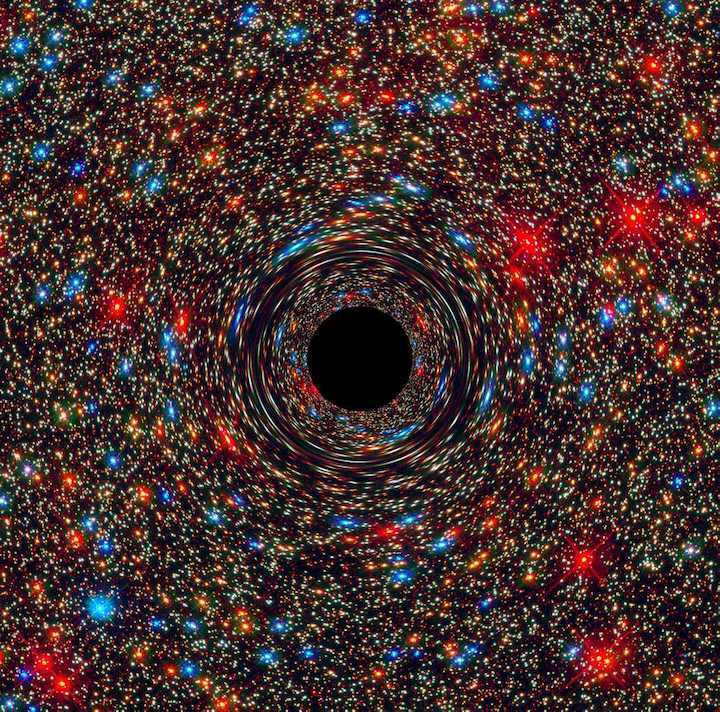 The telescope will catch whatever light it can detect from near the black hole. By combining the data from the various telescopes placed around the world, the Event Horizon Telescope has as much magnifying power as a telescope the size of the entire Earth. What does this have to do with Einstein's theories of relativity? The image from the black hole may give us more insight into Albert Einstein’s theory of general relativity, which he came up with in 1915. According to CNET, the shape of the black hole's event horizon could prove Einstein's theory or possibly cast new doubt upon it. But even if it casts doubt, the finding would not necessarily mean that his theory is wrong, but it would imply that we have more physics to understand, the Event Horizon Telescope website reported. The discovery will be unveiled Wednesday by the National Science Foundation at a 9 a.m. ET press conference. Wissenschaftler haben das erste Bild eines Schwarzen Lochs erhalten, indem sie Event Horizon Teleskop-Beobachtungen des Zentrums der Galaxie M87 verwenden. 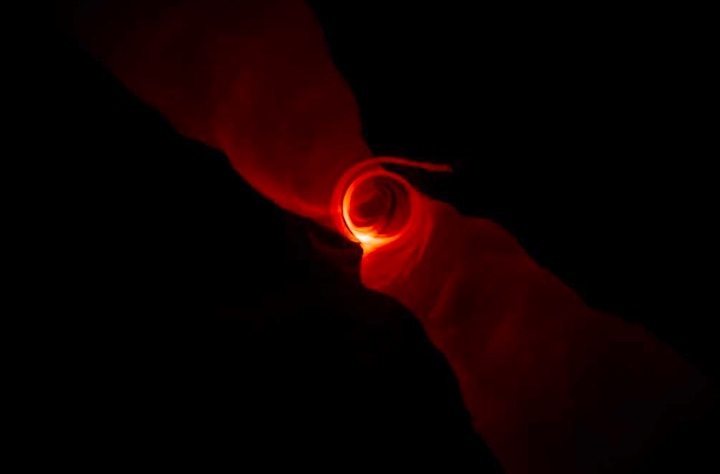 Das Bild zeigt einen hellen Ring, der sich bildet, wenn sich das Licht in der intensiven Schwerkraft um ein schwarzes Loch dreht, das 6,5 Milliarden Mal massiver ist als die Sonne. The EHT is not a single physical telescope; instead, it's an array of linked radio dishes across the globe, creating an Earth-sized virtual telescope. A black hole is an object with such strong gravitational pull that nothing, even light, can escape it. The black hole itself is invisible (don't expect to see anything like the special effects in Interstellar), but the surrounding matter illuminates its "shadow," which can be seen. 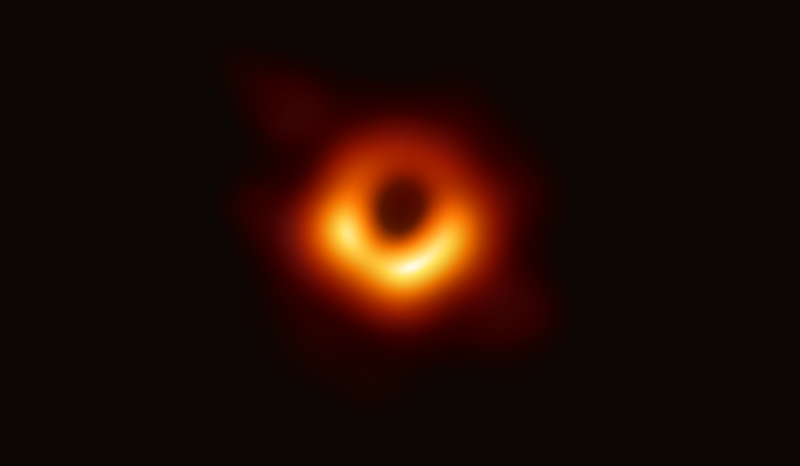 The particular black holes the EHT is focusing on are the central black hole in our own galaxy as well as the supermassive black hole in the center of galaxy M87, and getting a glimpse of these is a pretty big deal. To complement the EHT findings, several NASA spacecraft were part of a large effort, coordinated by the EHT’s Multiwavelength Working Group, to observe the black hole using different wavelengths of light. 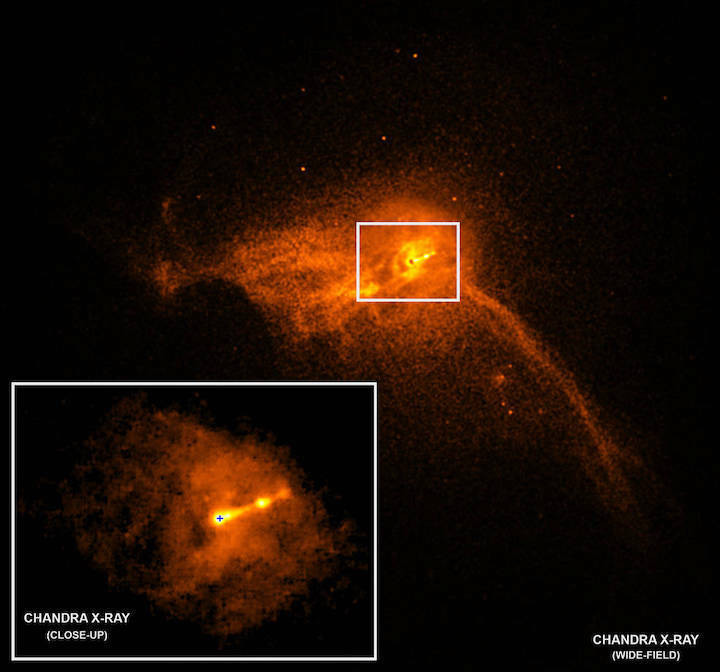 As part of this effort,NASA’s Chandra X-ray Observatory, Nuclear Spectroscopic Telescope Array (NuSTAR) and Neil Gehrels Swift Observatory space telescope missions, all attuned to different varieties of X-ray light, turned their gaze to the M87 black hole around the same time as the EHT in April 2017. NASA’s Fermi Gamma-ray Space Telescope was also watching for changes in gamma-ray light from M87 during the EHT observations. If EHT observed changes in the structure of the black hole’s environment, data from these missions and other telescopes could be used to help figure out what was going on.